Why not treat your family to a healthy and filling egg breakfast this week? Add a mug of green tea sweetened with your favorite honey. Kids would surely enjoy these for dinner too…just add a side salad or your favorite vegetable. YUM! These delicious breakfast pizzas are bound to be an instant favorite. After all, whose kids don’t want to eat pizza for breakfast, lunch and dinner? The great thing about these pizzas is that you can make them delicious and nutritious by using whole grain muffins and topping those with fresh-sliced tomatoes and low-fat mozzarella cheese. These are also a great break from the ho-hum routine of bland breakfast foods. Want to try something that POPs?!? These miniature treats are just the ticket. Cut English-muffin into halves and toast in toaster. Remove from toaster and place them on an un-greased cookie sheet. Next, slice the hard boiled eggs and add on top of tomatoes (1/2 an egg per muffin). 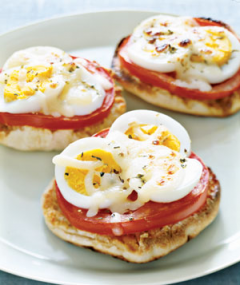 Top with healthy low-fat mozzarella. Sprinkle with oregano and/or kosher salt to taste. Put the cookie sheet on the middle-high rack and broil 3 and 1/2 minutes until the cheese melts (slight browning is OK). This entry was posted in Diet & Nutrition, Healthy Recipes and tagged Boiled egg, Breakfast, green tea, health, healthy living, healthy recipe, Kosher salt, Mozzarella, Muffin, Olive oil, Salad, Tomato, Vegetable.